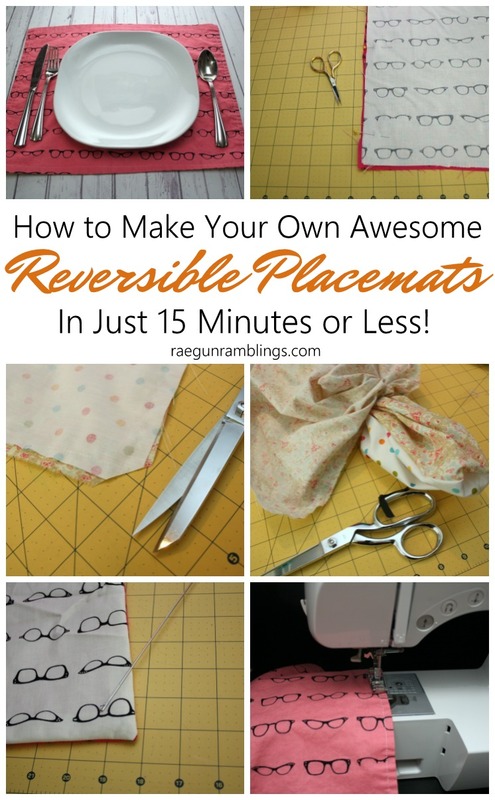 These reversible placemats are SO easy that kids could make them. Well actually kids DID make them. Last Summer when the nieces wanted to do “sewing class” I thought to myself, I really want some placemats for when they come over and eat like savages. And like the good Auntie that I am I decided to make them make the placemats themselves. I’m so excited to be FINALLY sharing this tutorial as part of 100 Directions’s National Craft Week series! 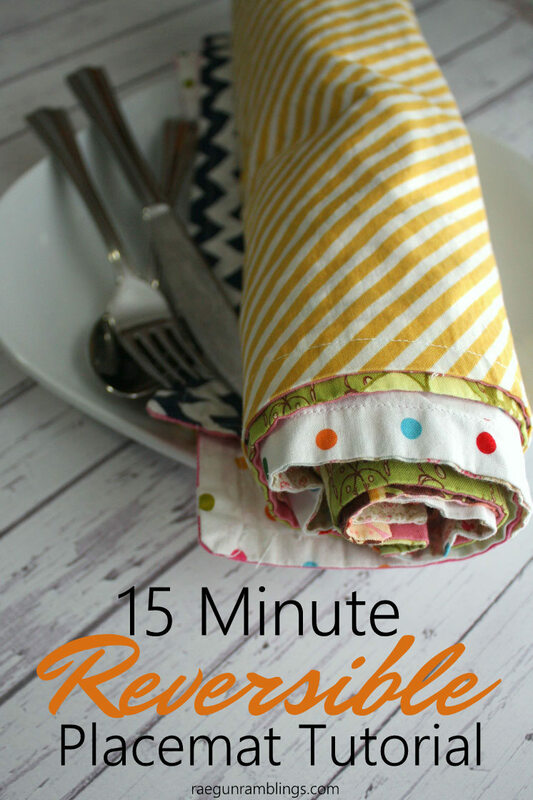 This project is super easy and fast which makes it a great beginner sewing project. Since you have to turn something right side out (you know to make them reversible) that’s a good technique that builds on what they learned with my go-to starter project the basic skirt. And this is all straight lines so good practice on that front too. And if you’re interested in what machine I like for beginners it’s this one, does everything you need (I still sew on this machine most of the time), affordable, and most importantly has speed control. I think the best part though is that the girls are were SO proud the first time we pulled them out for dinner. And any time someone new joins us they get a kick out of sharing that THEY made them. 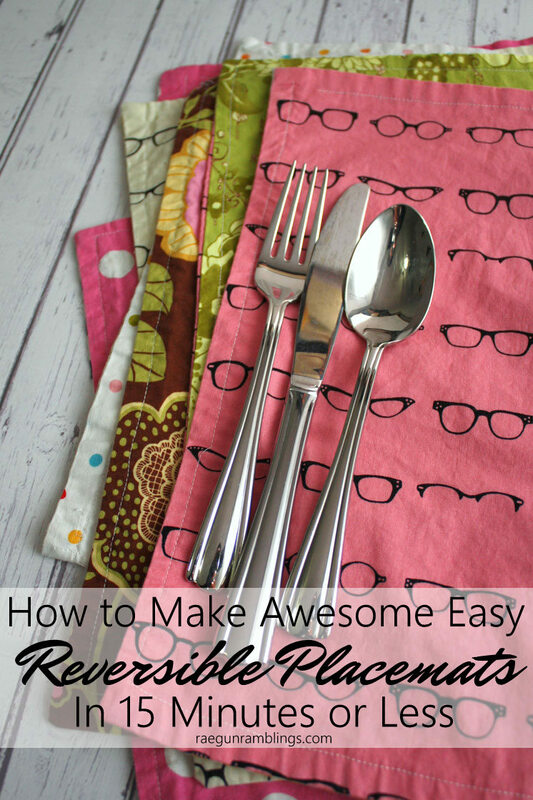 I’m writing this for one but obviously multiply it by however many placemats you want! 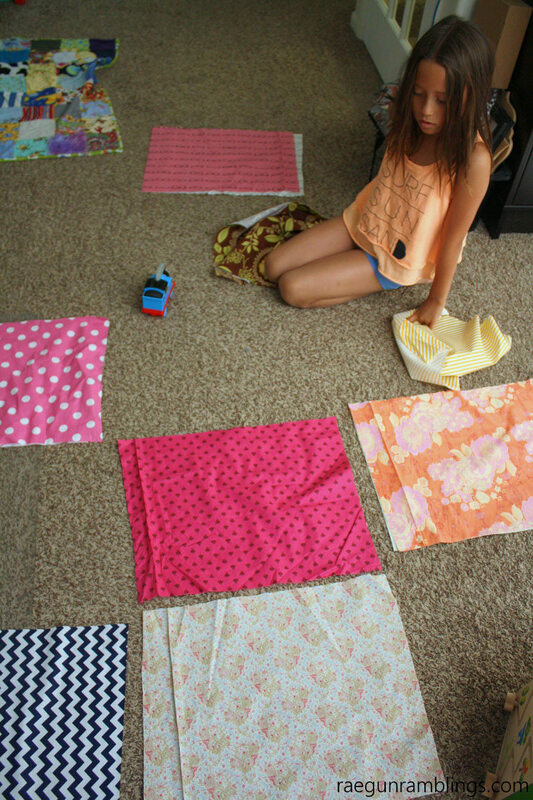 And a speed tip from a girl who sews a whole lot of the same thing over and over (ahem for my shop), cut all your pieces out at once and do the same step for all of them at the same time (as opposed to making one placemat completely and then starting another). Alternatively for motivation you might want to do one full one first or just a few so that you (or your sewing minions can feel successful and excited to keep going). Start by cutting all your fabric pieces to the right size. Keep in mind that placemats don’t have to be perfect you can do bigger or smaller if that works better for you (or your fabric stash) but the two pieces that will make up one placemat DO need to be the same size. Next decide which pieces of fabric will go together (the nieces loved doing this). Then with right sides (the pretty size) together pin around the edges with the pins going in perpendicular to the edge and the head of the pin on the outside. Starting at the middle of any side (so NOT at a corner) sew with a 1/2 inch seam allowance (that is the space from the needle to the edge of your fabric) and leaving a 2 inch space between where you start sewing and stop sewing. To do this sew around and when you get 1/2 inch from the corner use your hand wheel and turn it so the need is down then lift your presser foot and turn your fabric so you are on the next edge of the fabric. Clip your corners. Basically cut your corners off (this will help you get a nice point when you turn your placemat right side out). Make sure to cut close to but NOT over the sewing line. Next turn your fabric right side out. You can reach in and grab it or use a loop turner to help. The loop turner is SUPER cool but does take practice to get the hang of it. If you are a newbie that might be an unnecessary frustration but if you feel confident I encourage you to learn how to use one it will make so many things in your sewing life easier (see my video on how it works here). Make sure the corners are pushed out from the inside (I use a loop turner but you can use a pencil) and iron making sure the fabric is folded under at the opening through which you turned the placemat. Now topstitch around the edge of the placemat with a 1/4 to 1/2 seam allowance (I like the look of a smaller one but that can be harder for new sew-ers). This time sew all the way around and over where you started sewing this will close up the whole and also reinforce that initial sewing place. Make something delicious and eat it upon you new fancy placemat. Share it on instagram and tag me #loveraegun @raegunramblings so I can do a happy dance with you! And remember it doesn’t have to be perfect. The more you do the better you will get. In reality this is a piece of fabric to catch stray food (oh and to look pretty on the table I guess). But if your stitches aren’t straight no big deal that’s part of the fun make some more and get in some more practice! If you liked this you should also check out these! 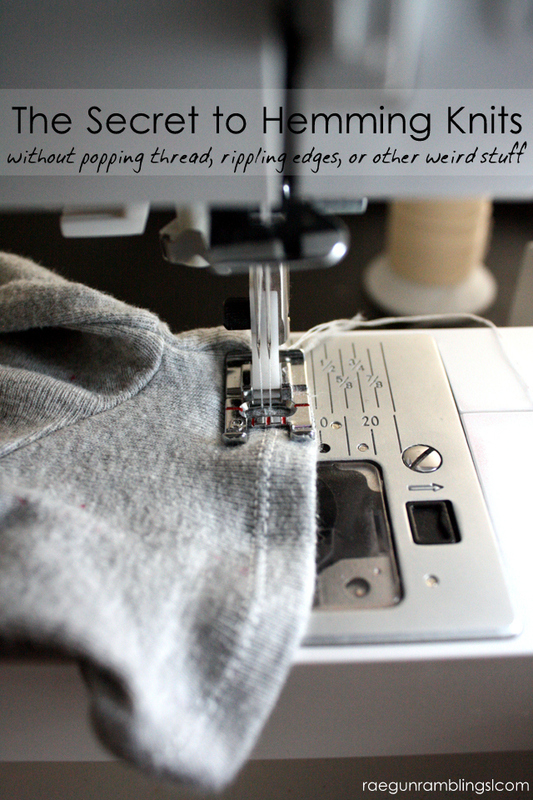 Have you ever wished hemming knits was easier? Wait until you read this trick it IS! How to get perfect chocolate covered strawberries every time! Love Harry Potter? 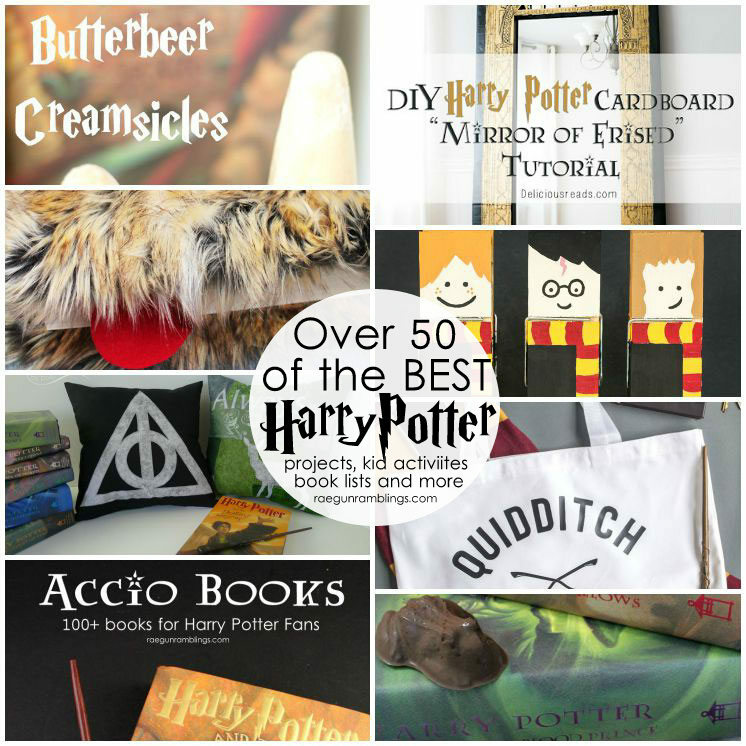 Here are over 50 magical Harry Potter projects? Want even more, see all my Harry Potter projects, travel tips and book recommendations here! 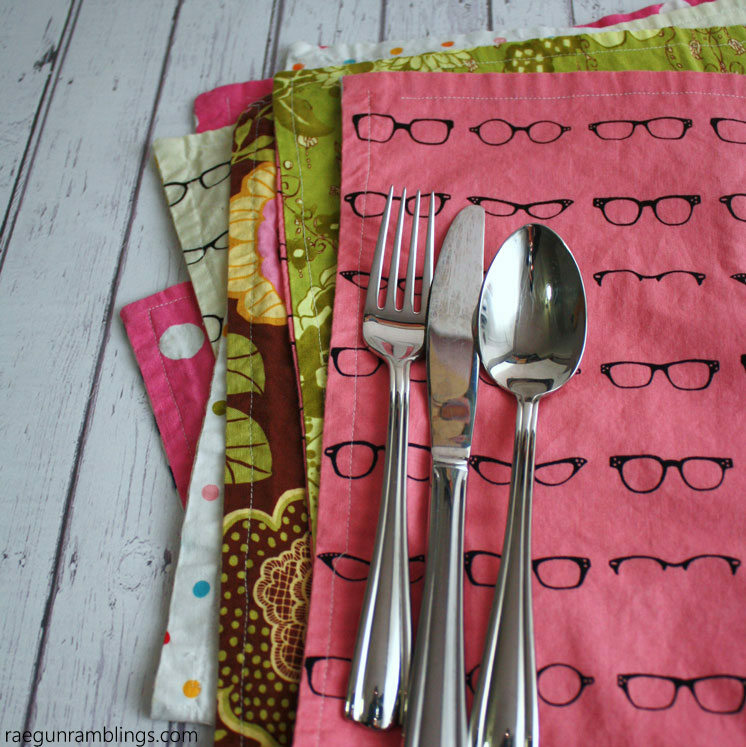 I love the glasses fabric. Too cute! Fantastic idea, I think I need to pull out all the fabric straps I’ve been wondering what to do with… and try a few placemats. Thank you so much for sharing such a fun project! I love the placemats. And what a nice thing to teach your nieces. It is a skill that will last a lifetime. 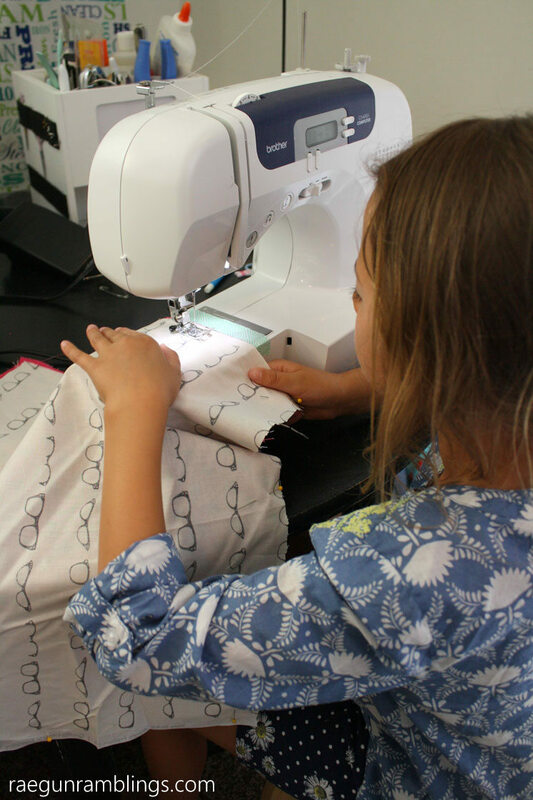 I’m holding a summer sewing camp in two weeks for young girls. I will add this to my project list to teach. I’m planning to make a set of placemats like this, but I want to add a layer of clear vinyl on both sides to protect them from spills. But I can’t find any instructions on how to do that. What would I have to add or alter to this pattern/tutorial to add those extra layers? I’m a novice to sewing so any advice you could give me would be great! You don’t need to do anything different just cut two layers of vinyl and place them on your fabric and then treat the vinyl and fabric like one piece of fabric so when they are “right sides together” you want vinyl to vinyl and then right sides to the vinyl. Hope that helps. Sorry I missed this comment earlier and just saw it. 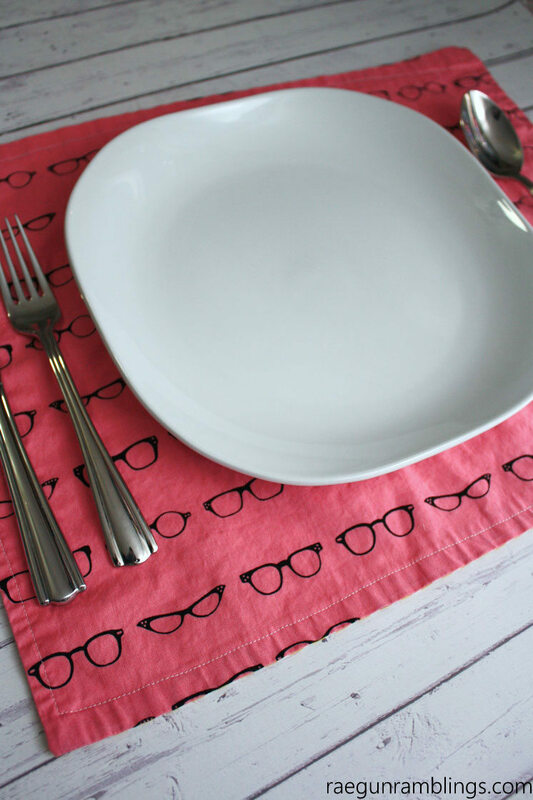 What a great way to have several ‘sets’ of placemats without so much storage space. Thanks for sharing this. yes the space saving is a great perk! thanks for the feature! I”ll be sharing it on The Daily Seam and Rae Gun Ramblings FB pages this week! How does this wash? Will I need to iron it? Just wanted to ask. I’m a beginner. Thank you!